"On Jan.1st, 1997, Chris John quit his job as a deliveryman for a feed store in Scarborough, Maine, got rid of everything he owned, moved out of his apartment and began a journey to strengthen himself and improve his perspective on life in our times. From 1997 to 2002, he traveled across the United States first by car, then on foot, then by motorcycle, then by truck, and then on foot again. Walk the Talk documents the journey he made in 1998 on foot. Carrying a back-pack with a small video camera mounted to it, he traveled in and out and up and down of every stratosphere of American society. From sleeping under bridges to relaxing at backyard barbeques, from solitary mountain tops to boisterous church revivals, from MTV to community television, whether he was completely alone or in the company of the many people he met, he processed each and every experience with the same goal in mind which was to develop the ability to maintain an unconditional attitude towards life, people and the world around him." Chris John is still on the road. 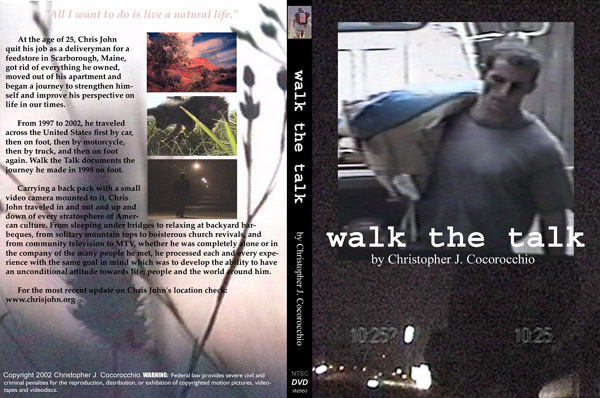 Walk the Talk can be rented at Videoport in Portland, Me, and the Kulture Cafe in Taos, New Mexico (or if you ever see Chris ask him for a copy).